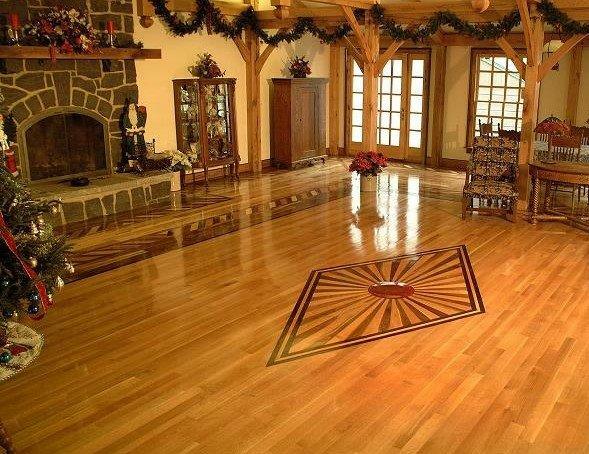 Ziggy’s Inc. was honored to be among the National Wood Flooring Association’s 2002 “The Rest of the Best” in the category of Best Job-Site Finished Craftsmanship and Design. Featuring six species in varying grades and widths, two borders of walnut, cherry and hickory frame the quartered white oak center of the room and the two hickory side areas. Radiating from a padauk sun, the sunburst medallion with walnut and cherry rays is accented by a border of alternating wenge and cherry.